The GerMAN artist, Daniel Richter is open to inspiration from anywhere, and he finds it virtually everywhere, from art history to comic books (he scoured local shops) to newspaper photographs. Almost anything is fair game. Then, after mixing, matching and merging ideas and elements from all these disparate sources, he manages to create something distinctively new — paintings and drawings that are unmistakably his. 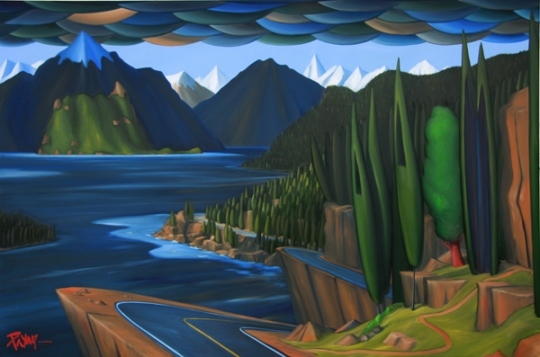 Some of these works would seem impossible to solidify because of the varied elements colliding in them. But somehow Richter holds everything in balance, using the competing and often unlikely mix of ingredients to supercharge the whole. 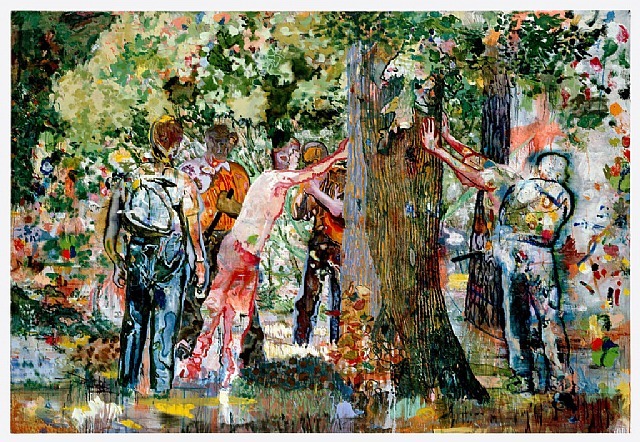 A telling example is “Tuanus” (2000) Oil on Canvas 252 x 368 cm , an enigmatic scene showing two men being put up against a tree and searched by four police officers, or more ominously, militia members. It’s unclear.